Operation is planned for 50.200, with VP6D transmitting during the first period JT65A mode. If local QRM from the HF stations requires any change from this frequency, it will be announced on the ON4KST EME CHAT page. They will be using a 6M8GJ yagi and >1000w output. Since they will be using their K3's on FT8 when on HF, they are currently expecting to be using WSJT-X for their JT65A mode operation. For the convenience of those of us still using WSJT10 for JT65A, they are planning to use an offset of 1270 Hz. This is their first time to use JT65A on EME, and the first time to use it during a pileup situation, so please be patient with them! Because of this, it is especially important to coordinate your calling frequencies on the ON4KST EME CHAT page, so the callers will be spread out. Ideally, please try to space yourselves out every 200 Hz to make it easier for them to decode individual callers. They will be using the W7GJ EME DXpedition procedure, so please familiarize yourself with that before calling them! They will be operating horizon-only, and will be primarily concentrating on each moonrise, which will provide a clear shot directly out over the ocean to their east. Look for them to be QRV starting then their moon is -2 degrees elevation and possibly as high as 20 degrees. After their first few days, we all will have a better idea exactly where they have the best ground gain lobes. Because there are a number of days during low Degradation when their moonset is to the northwest, there is a good possibility that they also will be able to be QRV during certain moonsets with the moon setting out over the ocean. Moonset operation will largely depend on the final siting of all the various operating stations and antennas. Updates on their anticipated moonset operation, as well as confirmation of their upcoming moonrise status and a list of stations worked will be provided on a daily basis. They will not have real time internet access, but this information will be relayed on the ON4KST EME CHAT page. There will be a number of opportunities for horizon-only station in Region 1 to contact them on the Ducie moonrise, although stations in western EU will need elevation to catch them during their moonrise. While most East Coast NA stations in Region 2 will need elevation to contact them during their moonrise, many horizon-only stations in Region 2 will be able to contact them during their shared moonsets with Ducie. Region 3 stations will need elevation to contact them during Ducie moonsets. 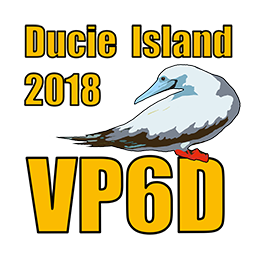 Many MANY thanks to the VP6D team for undertaking this limited 6m EME operation ;-) With the excellent EME CNDX during their trip, and the spectacular siting of their 6m yagi overlooking the ocean, it will be very interesting to see how many small stations end up in their log!